In Arizona, our big weather season is nearing the end. There has been little indication of monsoon throughout the state since the first week of September. A note for those not familiar with monsoon. It is a season in and of itself. We do not add season when speaking of monsoon. As with hurricanes where you need 80º water temperature to form them, dew points affect monsoon development. Weather patterns have not changed as of now but the dew temps need to be at 55º or above to form the storms. We may see monsoon before the month is done, but peak monsoon is long over. When talking about extreme weather conditions such as monsoon microburst and wind events, southern Arizona has a higher risk of a major event. 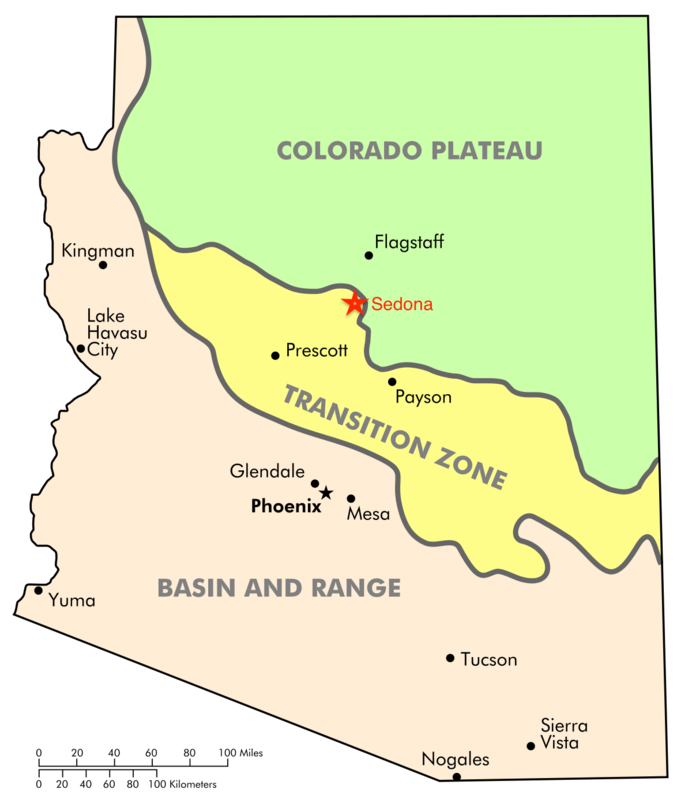 Sedona is surrounded by red rocks and mountains which minimizes conditions for major wind events and virtually eliminates dust events or haboobs. Waking up to fresh crisp air is very invigorating. It is one of the little things I enjoy about living here. In Sedona, our low temps have been in the 50ºs since August 23rd. I believe this keeps our high temps from shooting over 100º. The last day we were over 100º was on August 19th. According to 12 News Weather, today the Phoenix area is under an “Excessive Heat Warning”. The temperature is expected to get over 110º for the 23rd day this year. 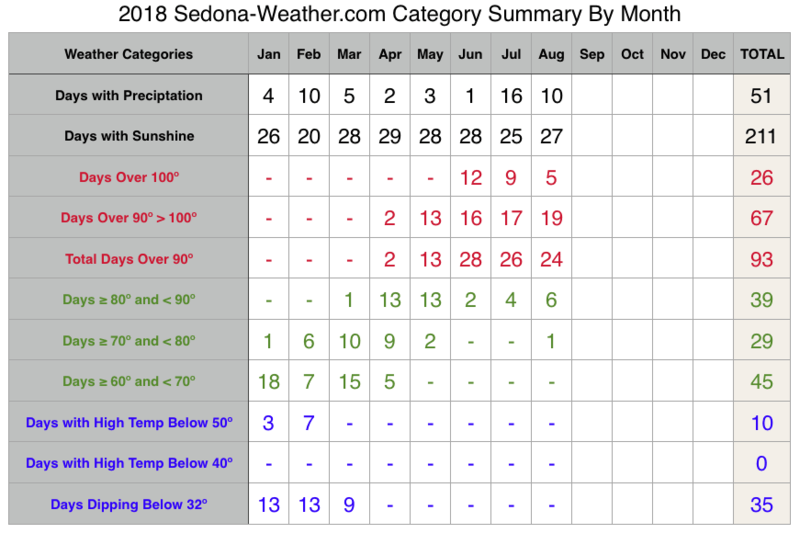 Phoenix averages 18 days OVER 110º normally. The highest number of days was 28. Arizona. It is located in a transitional zone between the Sonoran Desert and the Colorado Plateau, Being in the transition zone, the weather is more mild in the summer and winter months than other areas such as Phoenix in summer, and Flagstaff or Prescott in winter. 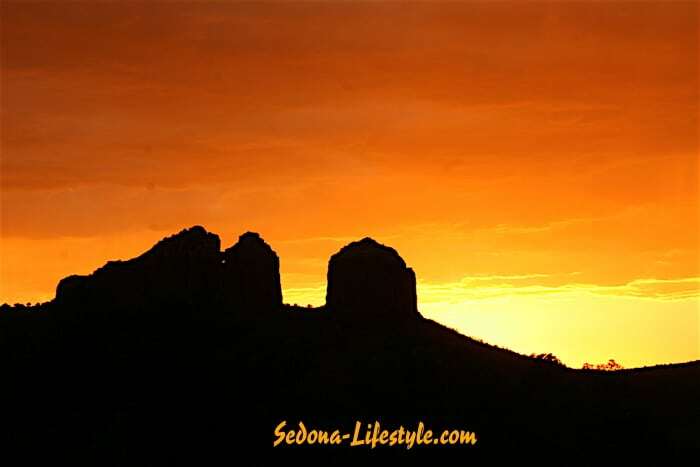 Sedona has had a total of two days that reached 110º in 8 years. 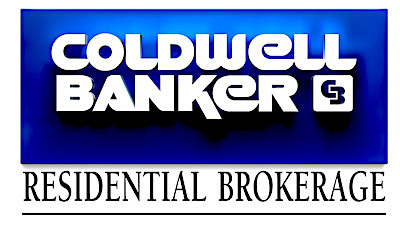 In those same eight years here in Sedona, our average number of days over 100º is 21. Most of those days hang around 102º. Ten to fifteen degrees makes a big difference when looking at extremes. Because Sedona and Arizona are in an arid environment, heat does not feel as oppresive because of the lack of humidity. There is a condition called “virga” that is prevalent in Arizona. To simplify, it is a condition where rain is falling from a cloud and evaporates before it hits the ground. People who visit as well as residents, have to be very cautious out in the heat because heat exhaustion and sun stroke can sneak up on you. Keep exercise to a mimimun, drink plenty of fluids and stay indoors as much as possible. Looking at extremes in cold temperatures, Sedona has had only two days (total), below 32º. One of those days was January 1st, 2011 and the other was March 20th, 2012. No other days since have had a high temperature that is below freezing. This means that there are very low instances of ice accumulation. Generally a small amount of snow or ice may linger in shaded areas. In other areas, the snow actually evaporates rather quickly after a snowfall. It appears to disappear! In areas such as Flagstaff and Prescott as well as the White Mountains, snow takes much longer to melt. You can see parking lots full of dump truck loads of snow and it does not go away quickly. Fortunately, our arid climate makes winter conditions more bearable even in the colder climates of Flagstaff and Prescott. When I moved to Sedona, I wasn’t sure how the winters were going to be. I am a fair-weather person and not interested in living in a cold climate. I found out that Sedona offered the best of all scenarios for four-season weather. We get it all, but in very moderate doses. It is rare that I have to wear anything but a sweater in winter. In Summer, there is little humidity. The arid air dissipates the affects of any humidity. You just don’t feel it. Fall and spring are so beautiful and very long seasons. Can you imagine springtime that starts early February and goes through mid-June? How about fall? Temps start hitting the 50ºs in mid August and freezing temps don’t start until around Thanksgiving. I can’t ask for anything more.